Book: To Have and to Hold - John Witte, Jr. This volume analyzes how, why, and when pre-modern Europeans documented their marriages - through property settlements, prenuptial contracts, court testimony, church weddings, and more. The authors consider both the function of documentation in the process of marrying and what the surviving documents say about pre-modern marriage. After analyzing the foundations of Western marriage set by Roman law and Patristic theology, the chapters provide vivid case studies of marital documents and practices in medieval France, England, Iceland, and Ireland, and in Renaissance Florence, Douai, and Geneva. 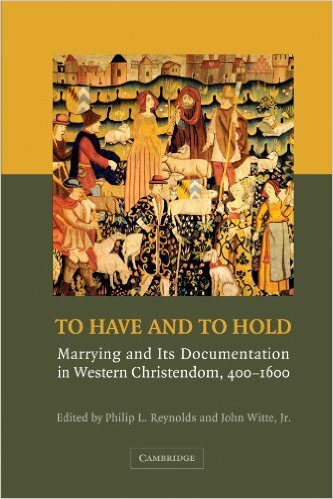 “A marvelous contribution to our understanding of medieval marriage traditions based on an analysis of the documents that preserve them."